HOME> Country Summary> Overland to Tibet? We travelled overland from Kathmandu to Lhasa, and flew back. So instead of a country summary, here’s a summary of that particular (and popular) trip. This may help if you are thinking of doing the same. A Nepali travel agency arranged the trip for us, which lasted 7 nights, 8 days. We splashed out on a private tour for two which costs $850 per person. Additional costs are: $379pp for flight (inc. tax) and $114pp for the Tibet visa fee. Total, a whopping £1,700 (£243 per day). This included all transportation, a driver, an English-speaking Tibetan guide, accommodation on a B&B basis, and entry to a number of temples and monasteries. It does not include lunch/dinner, drinks, or tips for the guides. The general advice about tipping is, you give $10 per day to your guide and $6 per day to your driver. Of course you can give more or less, depending on the level of service received. From overhearing other groups, there are not many guides in Tibet with completely fluent English. However, most are quite able to understand what you’re telling them and to explain the places you visit and what you see. Make sure you are not getting a Chinese guide, as they will have far less to tell you about the Buddhist Tibetan culture. Our guide, Tenzin, was a nice guy who had spent several years studying in a monastery, and as a result knows a great deal about Buddhism. Unfortunately, his English was not that great. 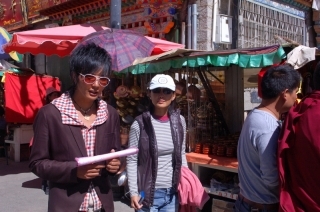 I had a lot of questions on Tibet and the Tibetan people, but it was very difficult to make ourselves understood. Sure we can read up on this stuff, but it is a real shame that we couldn’t ask our Tibetan guide while we were actually in Tibet. The hotels we encountered were okay, although power cuts and a lack of hot water are seemingly random and common. Rooms mainly aren’t heated, which in October was no problem in some places but quite cold in others. All except one of our hotels had a private bathroom and western-style loo. Our accommodation seemed to be in the £30-£40 per night range (based on seeing the prices in a couple of them). In our experience, hotel breakfasts in Tibet are about filling a hole. They tend to involve some kind of toast or bread (normally very dry), and eggs. Once, they involved peanuts. This is only for tourists, though – we could only look on with envy at the tasty-smelling soup that the guides and locals get. You need a driver, because the roads vary from superb to atrocious, and the behaviour of other drivers, pedestrians and animals is pretty random. We had superb weather too, it must be much more challenging with rain or snow to contend with. 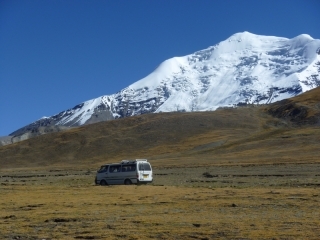 Some of the days on the overland route involve a lot of driving, perhaps up to eight hours. So take travel sickness pills if you think you may suffer, as the altitude sickness can really knock you down. Basic Tibetan food is pretty good – noodle soups with or without yak, or yak fried with juniper-pickled radish. All the towns and villages on the overland route have restaurants for tourists, with a wide mixture of Tibetan, Nepali, Chinese and western dishes depending on the establishment. On the whole the food in these places was good, but as usual we avoided raw veg and fruit. Anywhere you go, you can have a meal for two with drinks from £5 to £15 depending how flash you want to be. 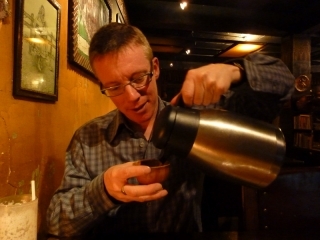 Tibetan butter tea is as gross as everyone says, and this is from someone who loves almost any food and drink he’s ever tried. Thankfully, you can get Chinese jasmine tea or Indian masala tea wherever you stop on the overland route, as well as the usual fizzy drinks. Personally we prefer a banana lassi over fizz any day. Some of the restaurants in the remoter parts of Tibet (near the Nepali border) have communal sloping hole toilets. The word you should focus on here is not “communal” or even “hole”. A “long drop hole”, or even just “hole” would be much more preferable (and hygienic) compared to the “sloping hole”. ‘Nuff said. Different people get altitude sickness to different degrees. On our first night (3,500m) I had a splitting headache, dizzy spells, racing pulse and couldn’t sleep; Maureen was fine. On the second night (3,900m), I had a headache while Maureen had a headache, nausea, racing pulse and couldn’t sleep. On the third night (3,900m) we both had mild headaches but were pretty much okay. However, we also found ourselves short of breath for the whole of the week, often wheezing after only walking up two flights of stairs. Probably related to the altitude sickness, we also both picked up colds (ironically, just as we were getting over the altitude). Contributing factors were probably: (a) the altitude sickness weakened us, (b) it can be quite cold, often unexpected when the sun is shining, (c) the population suffer from a lot of colds, and the Chinese especially hawk and spit their phlegm everywhere. Take: ibuprofen and cocodemol, both of which helped with headaches and apparently thin the blood a little (which helps); travel sickness tablets, which help with nausea; rehydration salts, which boost energy and aid recovery even if you have no diarrhoea. And coca tea if you can get it! The Kathmandu to Lhasa overland route is fairly well travelled, so don’t expect tents and yak herders on ponies; the villages have houses and motorbikes are more common. But it is still wild, open rural country in an amazing setting. The bigger places (Shigatse, Gyantse and Lhasa) still have old charming elements, but they are otherwise modern Chinese towns with wide concrete streets and buildings. 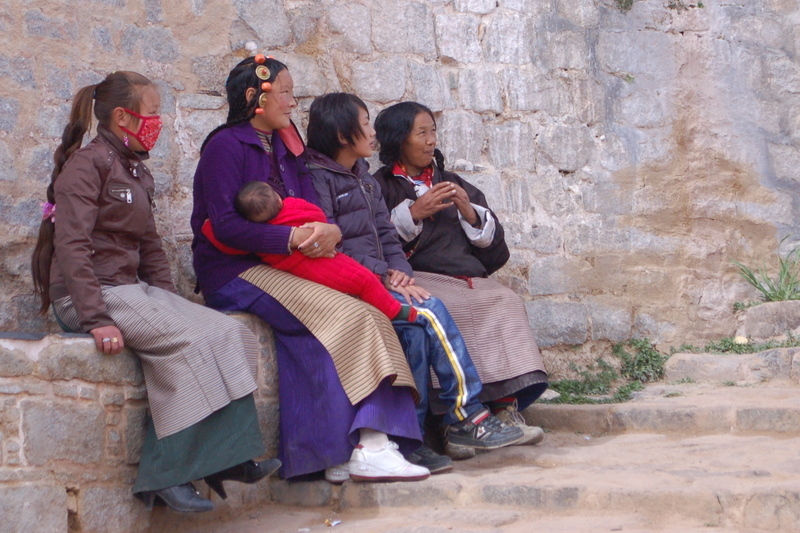 However, the Tibetan people everywhere remain very traditional and also always charming. During the trip, I read Seven Years in Tibet by Heinrich Harrer, smuggled in on the Kindle. It is like a fairy story. I could not reconcile the Tibet of his time, just sixty years ago, with the one I was experiencing. But what has not changed is the Tibetan people’s devotion to their religion and faith in their lamas. If you want to visit Tibet, then come quickly because this extraordinary country is experiencing cultural erosion of unprecedented alacrity. This entry was posted on Tuesday, October 19th, 2010 at 2:42 pm	and is filed under Country Summary, Tibet. You can follow any responses to this entry through the RSS 2.0 feed. You can leave a response, or trackback from your own site. 19/10/10 - Overland to Tibet?